Hey Doodlers! And Happy Thanksgiving to all our friends in the US! Well, another busy week at Doodle Towers, we're on Ideal World next week so we're currently up to our neck in CD's and artwork and packing and..and...and...stress! It's always a bit manic the 2 weeks prior to a show and then the week after (funny, in a month that means there's only one week which isn't!? hmm) but this time is worse due to the swine flu taking me out for a week and being way way behind..never mind, soon be Christmas and there is a brand new CD launch next week so that more than makes up for it! 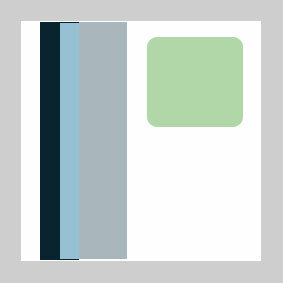 If you look closely at the Design Team entries and blogs this week I'm sure you'll see some sneaky peeks at the new stash! 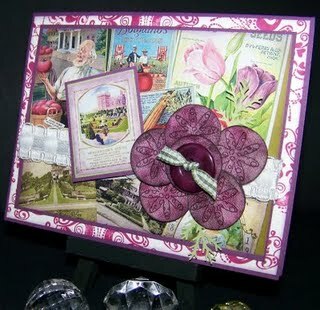 The show is Thurs 3rd Dec on Ideal World at 2pm. 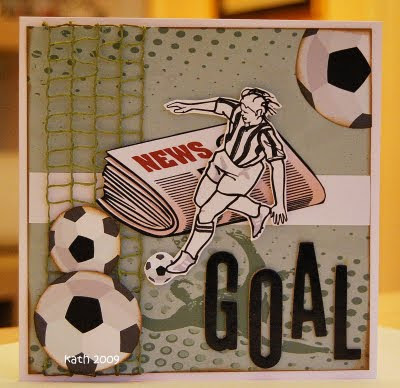 I also have to just mention that myself and the fabulous Kirsty Wiseman will be holding a joint workshop in York on Saturday 5th December 10.15 - 1.15pm - craft fun and mince pies galore if you can join us, we have a couple of places left so if you want further info please click here. and in First place is the lovely Little Ted - well done! So email me for your stash and blinkies girls please! 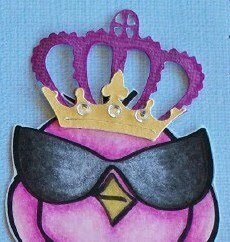 Before I go any further I have to give a massive thanks to the very fabulous Dolly, our Guest Designer for November, my that's flown! 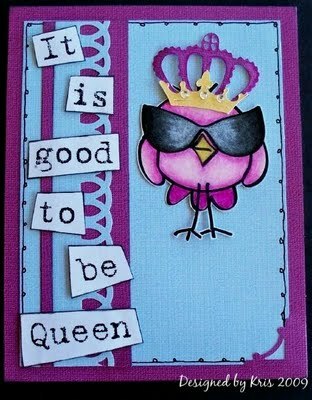 It's Dolly's last week with us but we have all loved her projects and we hope she'll be back soon, I am LOVIN' her card this week! 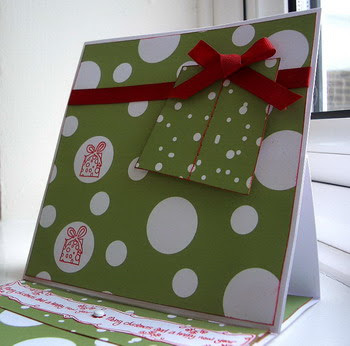 Made by Kerry..."I've been making Christmas cards from non Christmas papers, so decided to do the same for this challenge. 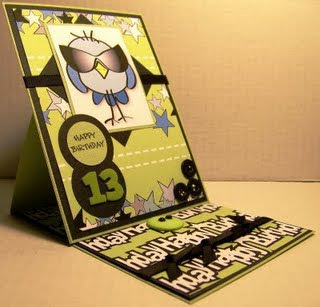 The background paper came from Candy Doodles, the papers for the trees and center strip came from Sugar Birdies. 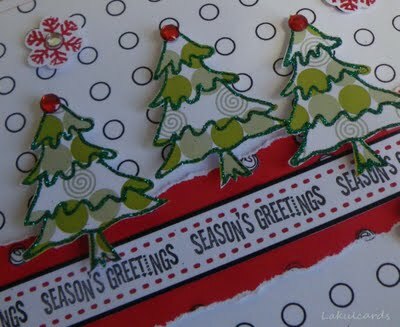 I embossed stamped snowflakes and glittered the trees. Added a few gems and stamped the sentiment across the paper ribbon also from Sugar Birdies. 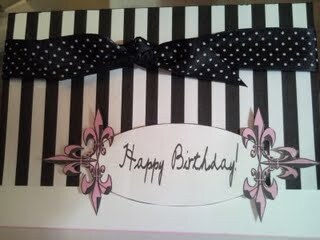 "...just fab! Made by Ruth...Ruth's given us a cheeky little peek at something new from the new CD Back To Nature here and this card is just lush..."I've used one of the images and all the papers are from Sugar Birdies. 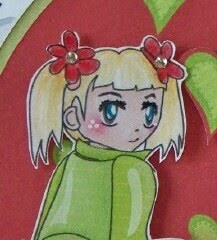 I made the flowers myself by roughly following the flowers on her hat. 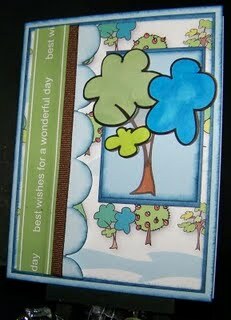 Stamps (around the flowers and sentiments) are the Candy Doodle ones." So, that's our offerings for this week - don't forget you have till Sunday 6th December to enter this one, leave your links in the comments below. You can still enter last week's challenge until Sunday 29th at noon so make sure you get your entries in! 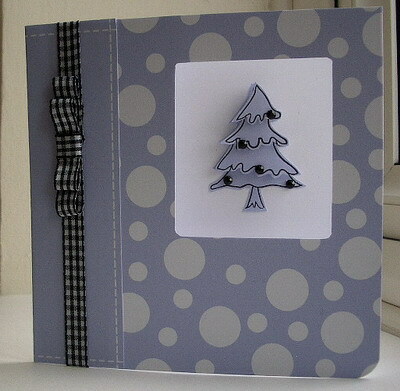 In the meantime I will see you all (hopefully) for the show next Thursday 3rd Dec, which is on Ideal World at 2pm. ttfn! Well bloggers, the cold weather has well and truly kicked in, together with the old swine flu. Yep yours truly has had it all week but thank goodness today I actually feel (relatively) normal again and thanks to everyone who helped me feel better in my hours of self-pity! Needless to say everything has been on hold for a week, so I am well and truly behind with the new CD and it will now be launched a week later on Thurs 4th Dec at 2pm on Ideal World. Methinks you will like. Me hopes anyway! So if you would like to be worked like a navvy week in week out for a miserly pittance sign up now! 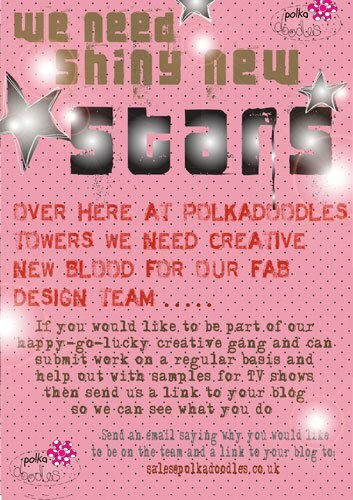 We are looking for a couple of new suckers sorry peeps so make sure you send me an email now! We will consider any age/gender/ability etc but please make sure you can commit to entering challenges at least every 2 weeks and can also help with samples for TV shows. New teamies will be announced beginning of December and the closing date is Fri 27th Nov at lunchtime. 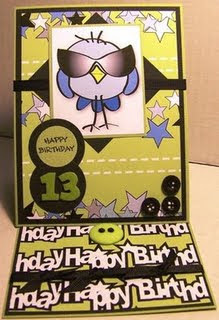 Made by Lou...This is so creative! I love the way Lou has used the train background which couldnt be any LESS girly to make this fab Crimbo card..all aboard the santa express...just inspiring Lou! 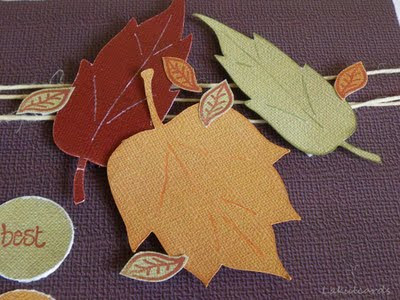 She's used several "plain" papers, layered the papers & then cut out some holly leaves & berries. The sentiment is made with rub ons. Made by Saskia...We're all really sad this week :( because this is Saskia's last week with us. She's been with us from the start way back in May and she will be a sad loss to the team with her quirky ideas and inspiration but she has oodles of other stuff she has to do. She has promised to look in on us from time to time though and I'm secretly hoping we will entice her back in the future! 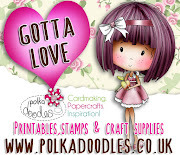 So, now onto our amazingly fabulous Guest Designer for this month, the uber talented Dolly. 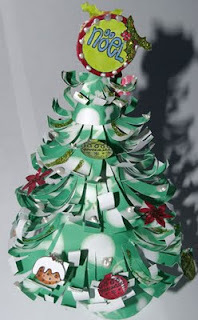 All through November Dolly is taking the same challenges as the Design Team but she has to make a Christmas equivalent! 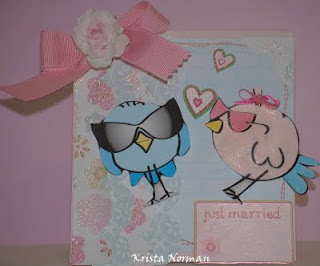 (I think she liked this cos she is slowly amassing all her crimbo cards, lol!). "Another simple one from me! 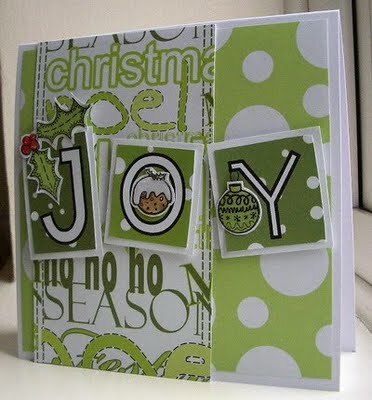 A christmas take on the sketch using Jingle Jangles CD and the christmas stamp set. 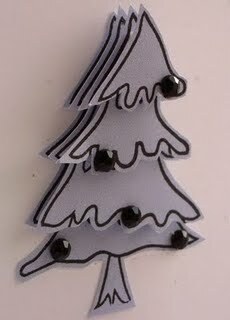 Used the snowball papers again but resized the sheet to A5 to get more snowballs on the card front, and the stitched paper saved me doing the stitching! 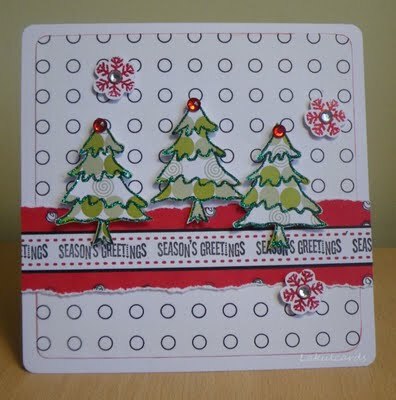 I decoupaged the stamped tree to give a bit of dimension and added some gems!" So that's it from us this week folks! 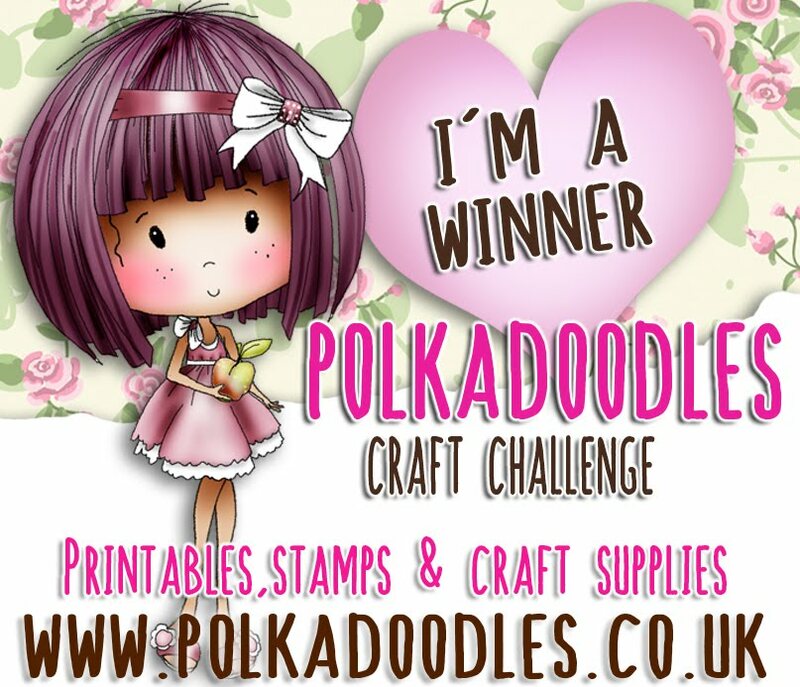 Remember you can win a fab CD for this challenge so get creating now! Please remember to follow the rules properly and entries must be in by Sunday 29th November at 12:00 GMT. Don't forget! You still have time for last minute entries to last week's challenge, entries don't close till this Sunday at 12:00, so make sure you get in on the action! I know I say it every week but time certainly does fly - Santa will have been and gone and missed me completely at this rate! I think as I've got older my time management has flown off and left me high and dry as I seem to always be in a rush and nowt ever gets done. Hey ho, better start writing my wish list now! 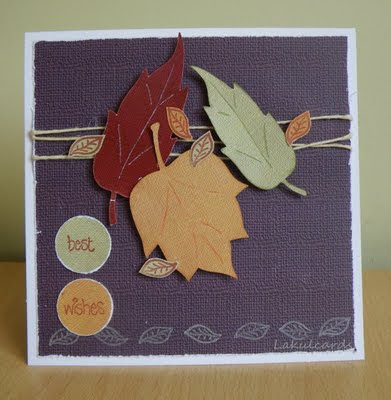 I have to give a wee mench to the fabulous Dolly, our Guest Designer for November - what a fab tutorial she gave us last week, shame yours truly was so late posting it, if you missed it make sure you check it out here. Dolly will also be giving us her take on this week later, can't wait! 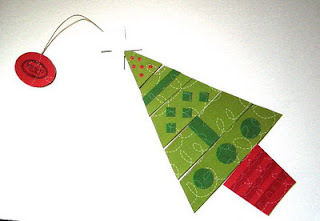 Now, don't forget you still have time to enter last week's challenge which is open until Sunday lunchtime for entries - you need to make some kind of Christmas Decoration using a stamp - and don't forget you can win a set of Rubber Stamps worth £14.99 so get those entries in! Right! 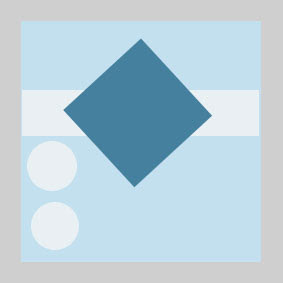 Our next challenge is to use the sketch below and use a Male theme. The Design Team have once again done us very proud with their interpretations of this sketch and given you lots of inspiration using the Not For Girls CD. Closing date is Sunday 22nd November at 12.00 GMT so remember you gotta be in it to win it! 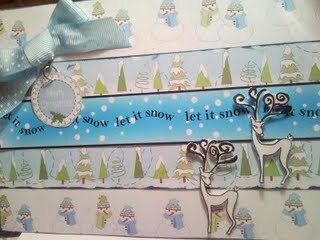 Here Dolly's made a great Easel card, using one of my fave snowball papers from the CD and then made her own cute parcel just by cutting a parcel shape and using ribbons. 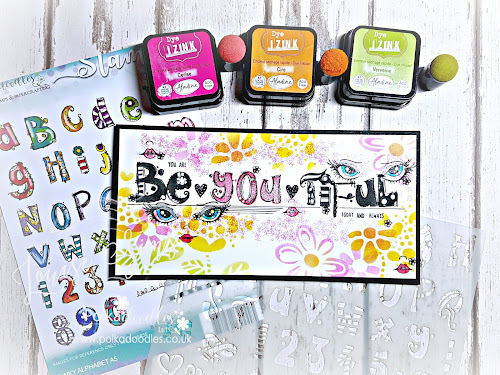 I really like how she's used the stamps in the circles instead of actually adding an embellie where the shapes should be on the sketch, very inspired! 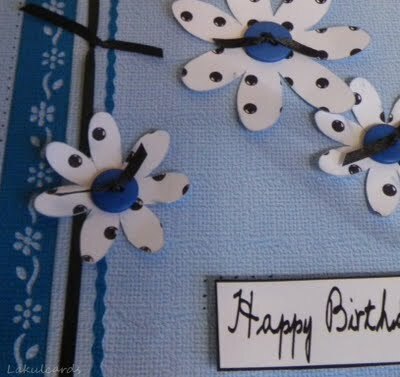 She's then stamped the greeting and used that as the catch for the card to stand up and attached a wee brad...another fab idea Dolly! Well it's better late than never! I know I promised a tutorial for Sunday and it is still Sunday - just! Sorry this is so late but I've had technical problems with the video and it's taken me about 4 hours and 3 attempts to do this tutorial and in the end I've lost a section but hopefully it's not too bad! Hope you enjoy it and have a go. 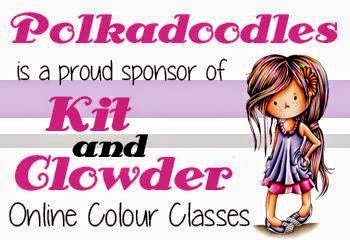 "Was I surprised when the lovely Nikky, the multi talented designer of all things Polkadoodles asked me to be a Guest Designer for November? Took me about 30 seconds to decide and say 'Yes!'. 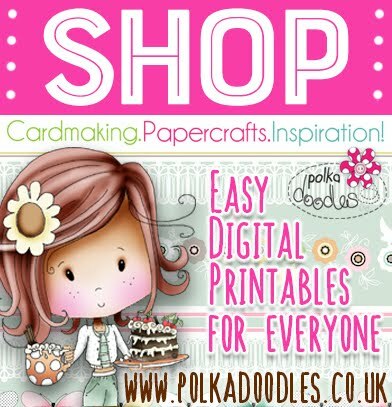 I love Nikky's designs and the DT over there are a talented bunch so I was honoured to be asked to join them. 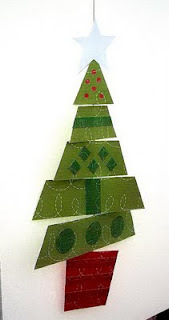 This week the Polkadoodles challenge is to create a christmas decoration and here's my christmas tree mobile. And here's how I made it. 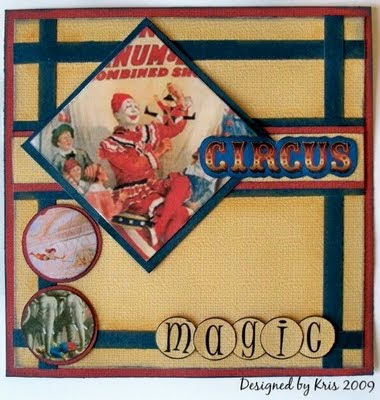 The papers I've used are from the Jingle Jangles CD. 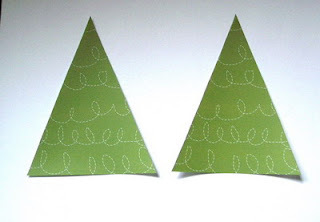 Cut two triangles of patterned paper measuring 16cm at the base and 20cm high. 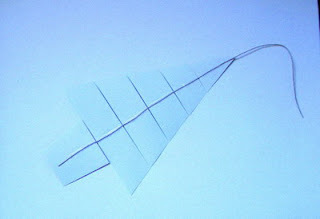 Cut 2 6.5cm squares of contrasting paper for the pot and shape the sides making them more pot-shaped! 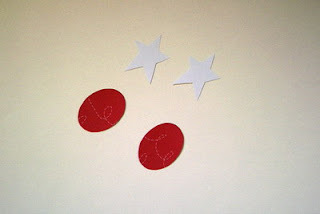 Cut 2 Stars for the top of the tree and 2 Ovals for the hanger. 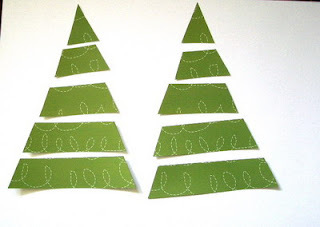 Place one set of tree pieces and the star face down leaving a 2mm gap between each piece. 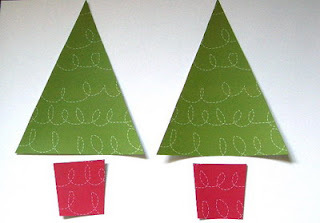 Take a piece of string and stick it to the centre of each tree piece with some tape, keeping the string as straight and as near to the centre as you can. Otherwise it'll be 'wonky'! Now stick the corresponding pieces on top with glue, decorate both sides and stamp a sentiment on the oval hanger. 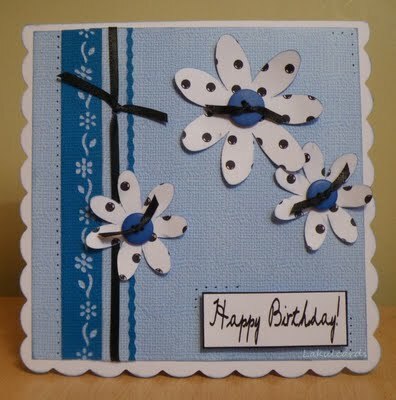 I'm going to make a few of these to send as cards, it folds quite easily to fit into a standard sized envelope. 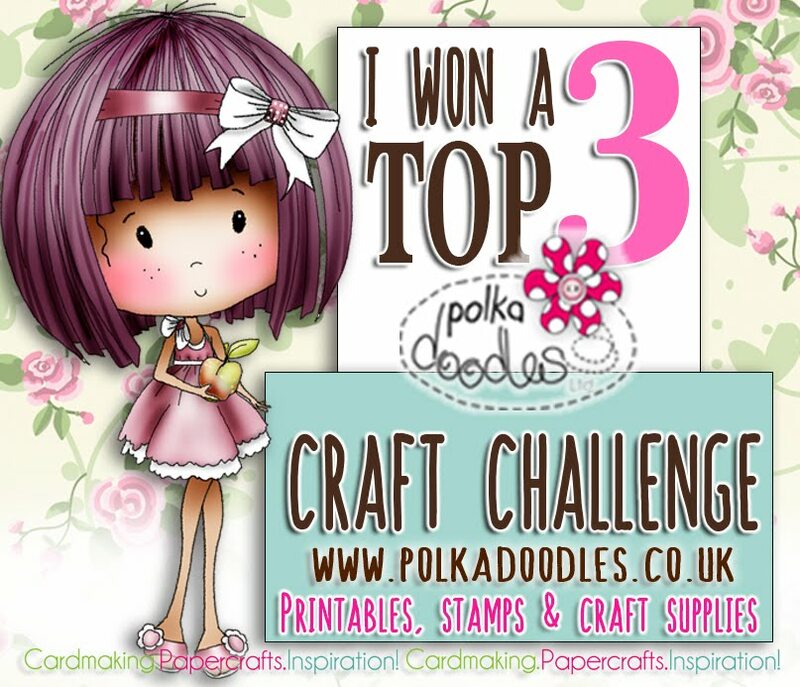 Hope you can join in with the challenge this week, it closes on Sunday 15th November. 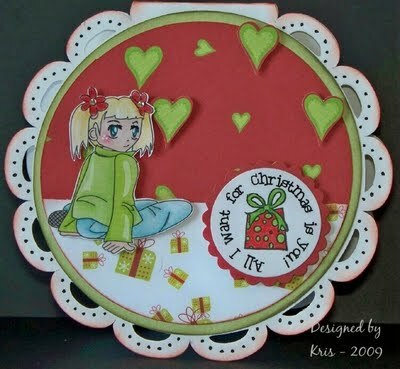 There's some lovely designs by the DT to inspire you to get crafting for christmas, be sure to check them out !"